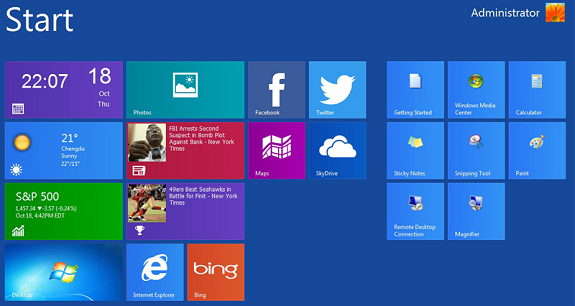 Modern UI (Metro UI) is the most visible feature that differentiates Windows 8 from Windows 7. Majority of Windows user won’t even notice Windows 8 running on a PC in desktop mode unless they see the Metro or Modern interface. Even though there are loads of changes in Windows 8, this Modern UI is one feature which is desired by users running the older versions of Windows like Wndows 7, Vista or even XP. Whenever a new version of Windows is released, many apps and tools are also released by developers and third party vendors which help users imitate the new Windows 8 looks and feel on older version of Windows. WinMetro from Iobit is one such application which helps you get Windows 8 Modern (Metro) UI to Windows 7, Windows Vista and even the decade old Windows XP. Just Install Winmetro on your old Windows, whether its Windows 7, Vista or XP and enjoy the tile based Windows 8 Modern UI displaying information such as weather, calendar, news, stocks, and frequently used programs just like windows 8. You can even boot your system or PC directly to Metro Start Screen. It supports both 32 bit and 64 bit version of old Windows. If you have used the “Charms” bar in Windows 8, this application can even add that bar giving easy access to settings or the “search” tool in Windows. Keep in mind that WinMetro is still in beta stage and far from a stable product. The latest version of WinMetro is numbered Beta 1.0 having a installation file size of 5.17 MB. Just download from the softpedia link at the bottom. And yes, the official webpage does have a issue with the download link as you rightly pointed out. I am not sure why, but would love to hear from Iobit.